Ronald Crutcher, president of the University of Richmond and former provost at Miami (photo courtesy of University of Richmond). The Miami University Symphony Orchestra, directed by Ricardo Averbach, closes its centennial season with a special free concert at 7:30 p.m. Thursday, May 4, in Hall Auditorium. 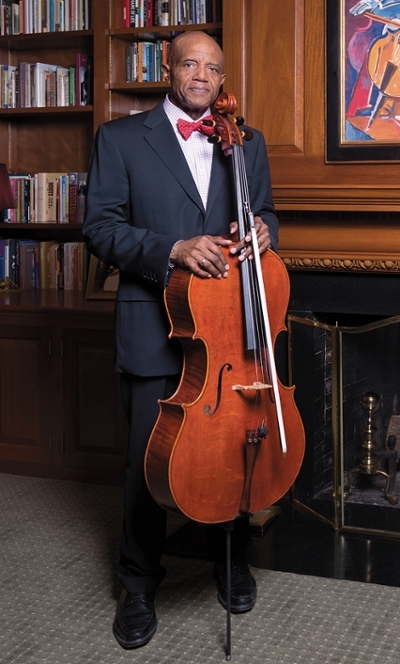 Cellist Ronald Crutcher (Miami ’69), president of the University of Richmond and former provost at Miami, is a featured guest soloist. “The Swan” from “Carnival of the Animals” by Camille Saint-Saens, dedicated to Potteiger. “Song of the Black Swan,” for cello and piano, by Heitor Villa-Lobos, dedicated to Aldo Parisot, Crutcher’s teacher at Yale University. Averbach will perform on the piano. Crutcher, a distinguished classical musician and a national leader in higher education, became the 10th president of the University of Richmond in 2015. He was provost and vice president of academic affairs at Miami from 1999-2004. He is president emeritus of Wheaton College, where he served from 2004-2014. He made his Carnegie Hall debut in 1985 and was the first cellist to receive the doctor of musical arts degree from Yale University. A former member of the Cincinnati Symphony Orchestra and several other symphonies — including the MUSO during his student years at Miami (see below) — he currently performs in the U.S. and Europe as a member of the Klemperer Trio with Erika Klemperer (violin) and Gordon Back (piano). He serves on the board of the Richmond Symphony and has served on the boards of the Boston Symphony Orchestra and Berklee College of Music. 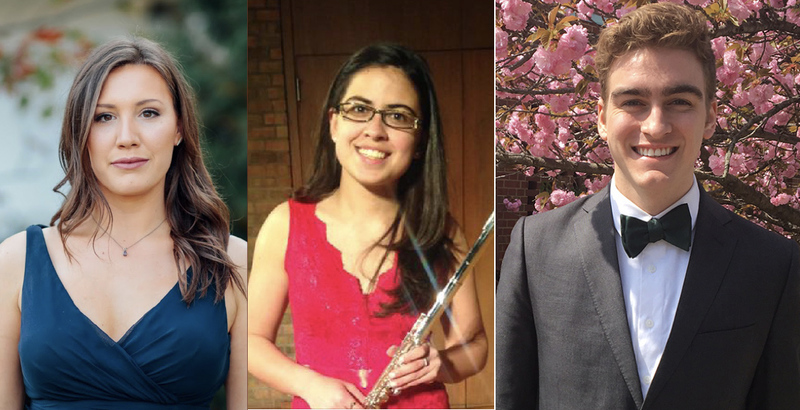 Left to right: Concerto competition winners Andrea Davies, Brianna Searling and Nathan Rayans. Soprano Andrea Davies, senior music performance major and music theatre minor, will perform songs by Handel, Mozart and Franz Lehar. Flutist Brianna Searling, second year master’s degree student in flute performance, will perform “Fantaisie Pastorale Hungroise,” by Franz Doppler. Pianist Nathan Rayans, sophomore music performance and manufacturing engineering major, will perform Edvard Grieg’s Piano Concerto in A Minor. “Nearly every element heard throughout the duration of ‘Arcade Variations’ was extracted from the carcass of an existing video game theme,” said composer Per Bloland, assistant professor of music. The selected themes date from the beginning of the short history of video games through the present. Some of the themes are obvious, others much more hidden, Bloland said. Can you recognize the video game music themes? Bloland created a webpage that lists all the themes used in “Arcade Variations” with links to YouTube examples of each one. He plans to run a contest to see who can identify the most video music themes during the performance. Forms will be available that list the themes, with a space to enter in the time at which each one occurred. A projection of a stopwatch, which will start on the downbeat, will be visible onstage to use as a time reference. Former members will join the MUSO for its closing piece, the Waltz from Khachaturian’s "Masquerade" — the group's signature piece that they performed at Carnegie Hall in 2012. No tickets required, admission is free. Below, the Miami University Symphony Orchestra, 1965-1966 season. Ronald Crutcher, a first-year student, is the second in the first row of cellos (photo courtesy of Donald Harrell, Miami '68).